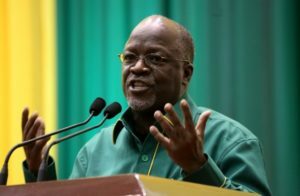 The Catholic Bishops in Tanzania Sunday denounced the violations of democratic principles and freedom of expression by President John Magufuli’s administration. In a pastoral letter, the Conference of Catholic Bishops of Tanzania said political activities are prohibited by the instrumentalization of the police. The Church accused President Magufuli for his silence. Activities of political parties, such as public gatherings, demonstrations, marches, debates inside premises are suspended until the next elections in Tanzania. Denouncing violations of the Constitution and national laws, the Bishops stressed that media are closed or temporarily suspended, thus restricting the right of citizens to information, freedom of opinion and expression and their right to privacy. The Church indicated that the current political atmosphere bred division and hatred that could endanger peace, security and the lives of citizens. Since his inauguration three years ago, Magufuli has overseen numerous closures and suspensions of media outlets. His government has undermined judicial and parliamentary independence, implemented a partial ban on public rallies, harassed MPs, closed online political space, and prosecuted critics under new defamation and sedition laws. Nicknamed “Tingatinga” (Bulldozer in Swahili), President Magufuli has however made an impression, being unyielding in the fight against corruption in the East African nation. Posted by Steven Addamah on February 12, 2018. Filed under Zoom. You can follow any responses to this entry through the RSS 2.0. You can skip to the end and leave a response. Pinging is currently not allowed.